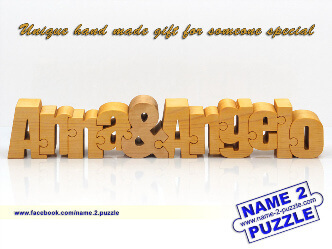 Create your own personalized puzzle - with two names joined by an ampersand “&”, a heart or first name and surname! Each letter is cut down precisely by hand and perfectly joins onto the next letter/symbol. 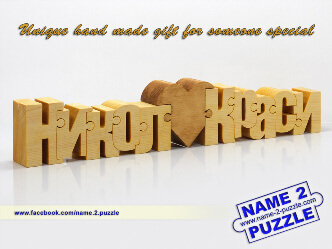 The names puzzles are unique and designed individually. 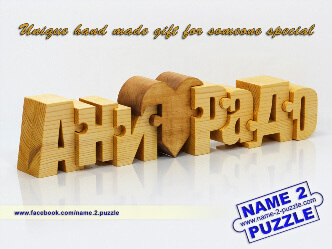 The puzzles are made from one piece of quality pine wood and handcrafted with a natural child safe finish of olive oil. The puzzle can lay down flat or stand up for display on a shelf or desk. 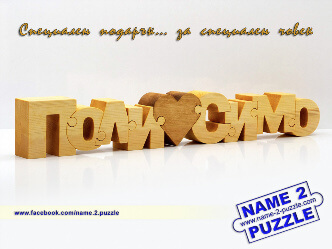 Surprise your loved ones by giving them a personalized two names puzzle that will freshen up their room or office décor. It is a great gift for birthdays, holidays, anniversaries and special occasions. There’s nothing quite like the feeling a child or an adult gets when they see their own name in a puzzle. You’ll know by the smile, the twinkle in the eyes and when you hear them say: “Oh, that’s MY name!”. The person that receives this present feels special, unique, noticed, important - and best of all, loved. This is a gift that will be treasured forever! NOTE: We do not have ready to buy two names puzzles. We make them only by order. Dimensions: 40 x 7.5 x 4 cm. Dimensions: 45 x 7 x 4 cm. Dimensions: 40 x 8 x 4 cm. Dimensions: 32 x 8 x 4 cm.